One of the roles of our Dynamic Movement Orthoses (DMO) Clinical Export team is to support other clinicians prescribing our orthoses and help them spread the word about DMOs and our clinical success stories. Although travelling to visit our export countries and international distributors may sound glamorous there is a lot of hard work involved often comprising of challenging travel schedules and very long days. So what exactly happens on an international overseas visit? 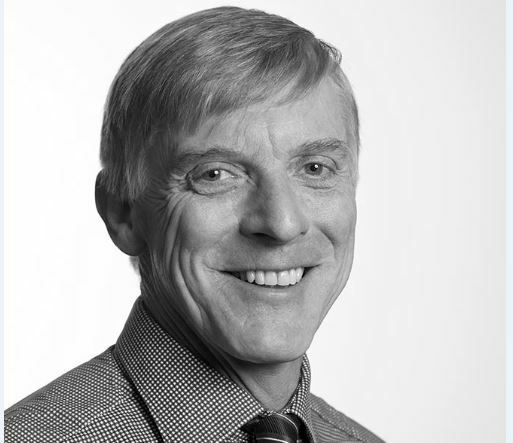 We took a sneaky peek into the life of Managing Director/ practicing Orthotic Clinical Specialist Martin Matthews to see what he gets up to on his visits abroad with DM Orthotics. 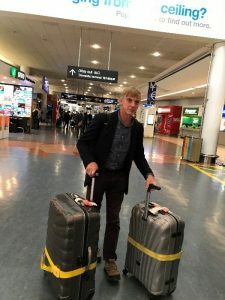 < Martin arriving at Auckland airport having been travelling non-stop for 24 hours. November saw Martin embarking on a three week round the world road trip starting in the USA. The first part of the trip saw Martin taking in four US cities within six days including: meetings with our distributor Boston Orthotics and Prosthetics (BO&P); seeing patients at BO&P’s clinic; carrying out three presentations; as well as manning the BO&P stand at the Academy of Paediatric Physical Therapy ( APPTAC) conference in Cincinnati. The next part of Martin’s journey saw him head to New Zealand to present at the Oceania Seating Symposium and then on to Australia to catch up with our other global distribution partners Korthotics. 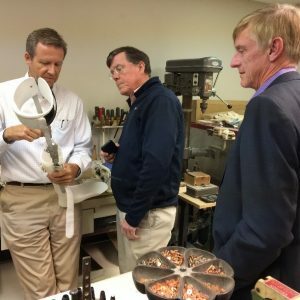 Read on to find out more about Martin’s trip and to see a typical schedule of what he gets up to on his export visits. Seven hour flight ( back in time) from London Heathrow to Boston MA – arrive 11pm and go to Hotel. Pick up at 8am and off for 9am presentation to Occupational Therapist’s at Boston Children’s Hospital with Jim Wynne, followed by meetings with our distributors at their base in Avon . Morning flight to Pittsburgh before driving to BO&P of Wexford branch to meet their Certified Orthotist and Clinical Director of Pittsburgh Region Craig Edmunds and Sarah Cunzolo COA, CFo and CPed. Afternoon preparation for a two hour evening introductory presentation on DMOs alongside Jim and Craig in Pittsburgh. The presentation was titled “The Therapeutic Use Of Dynamic Movement Orthoses” and explained and discussed the use of DMOs and actively encouraged audience participation with clinicians trying on the DMOs to experience ‘in the flesh’ the effect of DMOs. Martin doing his two hour joint presentation with BO&P to 34 clinicians. Drive from Pittsburgh to BO&P branch at Wexford Cleveland Ohio to meet the team including Arthur ‘Skip’Guildford III CPO the branch manager. Three orthotists in problem solving mode! A quick spot of lunch followed by a clinic seeing patients with Jim and Skip before changing venues for an evening interactive two hour presentation to over 50 clinicians at a Cleveland Hospital by Martin on DMOs. 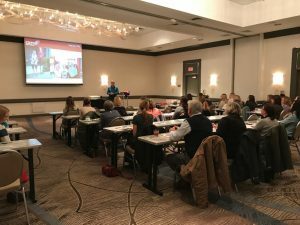 Drive to Cincinnati and prepare for the Academy of Pediatric Physical Therapy (APPTAC) conference assisting Jim Wynne on the BO&P Stand followed by the evening welcome meeting – an opportunity to network with conference delegates. Assist Jim on the BO&P stand promoting DMO products which are supplied through BO&P as our American distributor. Two very busy two and a half hour sessions meeting clinicians and demonstrating products. 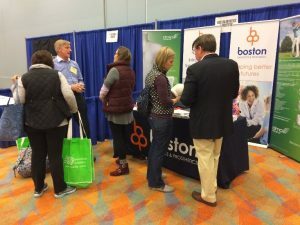 The exhibiting hall was bustling with physical therapists from all over US many of whom came to talk to Jim and Martin about BO&P’s services and products, including their supply of DMO’s. Martin and Jim talking with delegates on the BO&P stand. 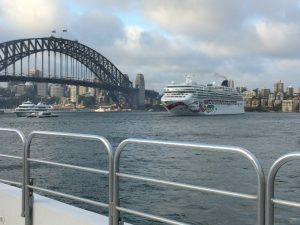 Lose Sunday crossing International Date Line – it’s now Monday! Arrive early in Auckland (having been travelling for over 24 hours since leaving Cincinnati.) Pick up hire car and drive to Rotorua to prepare for Tuesday’s presentation at the Oceania Seating Symposium 2017 20-22nd Nov and to meet our New Zealand distributor’s Permobil ( DME) team. Martin is a guest speaker and presents his abstract entitled” Recent Changes in Orthotic management of children with neuropathic onset scoliosis: implications for seating provision”. Martin presenting his abstract at the conference. The rest of the day is spent attending other presentations as well as manning the Permobil ( DME) stand to answer any questions clinicians may have on using DMOs. 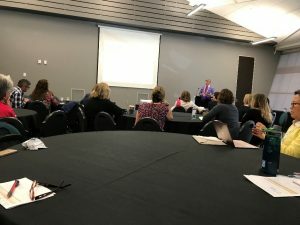 This conference attracted clinicians, researchers, manufacturers and others in the areas of seating and positioning and wheeled mobility and saw 300 delegates in attendance. The evening is spent attending the Conference Dinner- another opportunity for networking with delegates and meeting all the Permobil (DME) team. Assist on the Permobil stand talking to delegates about the use of DMOs. Wednesday afternoon drive back to Auckland. Meetings with New Zealand clinicians in Auckland to talk all things DMO. Martin teaches a full day training course named “Assessment, Measuring and Prescription of Dynamic Movement Orthoses” to a group of clinicians from the Auckland area and beyond. 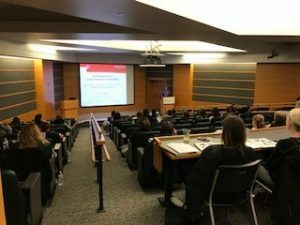 The course teaches clinicians how to assess, measure and prescribe DMOs and involves plenty of interactive hands on learning as well as patient success videos and theory elements. Morning meeting with New Zealand clinicians. Sunday 26th Official day off and time to relax- America’s Cup style! 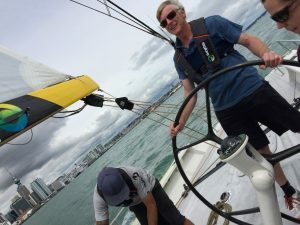 Martin helming one of the America’s Cup yachts around Auckland. Full day seeing patients and supporting Permobil ( DME ) clinicians in their clinics. Morning meetings with Permobil (DME) team and seeing patients followed by a quick afternoon dash to the airport to catch a three hour flight to Sydney. Full day of meetings with our Australian distributor Korthotics as well as seeing patients and supporting Korthotics clinical staff. 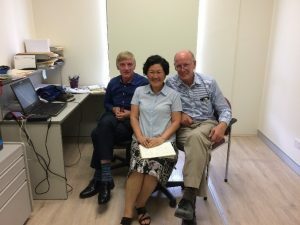 Left to Right Martin with Director Young Choi-Smith and Managing Director/Orthotist Merrick Smith at the Korthotics Office in Guildford, Sydney NSW. Planned DMO course and non-office day back at hotel, writing export reports. A non-office day connected to hotel Wi-Fi to catch up with the constant stream of emails. Often this can be over 100 new emails a day. Day off Sydney sightseeing including the Opera house and Bridge. Return flight to London via Singapore. Catch a seven and a half hour flight to Singapore before boarding a 13 and a half hour flight back to London. Arrive at London Heathrow at 4.45am having been in transit for over 24 hours going back through several time zones. Martin gained time but despite over 20 hours in the air he left Australia on Sunday afternoon and arrived in the UK on Monday morning. So how does Martin cope with the inevitable jet lag that accompanies such a long trip? His answer is to power nap from time to time as practised by many airline pilots. He also says that he tries to sleep on the plane when the lights in the cabin are dimmed in order to get used to the time zone to which he is travelling.